In his blog post, Dennis showed how to attack the public key encryption based authentication methods of IKEv1 (PKE & RPKE) and how to use this attack against IKEv2 signature based authentication method. In this blog post, I will focus on another interesting finding regarding IKEv1 and the Pre-Shared Key authentication. 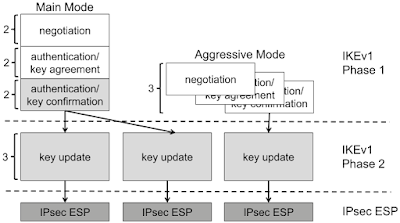 As shown above, Pre-Shared Key authentication is one of three authentication methods in IKEv1. The authentication is based on the knowledge of a shared secret string. In reality, this is probably some sort of password. 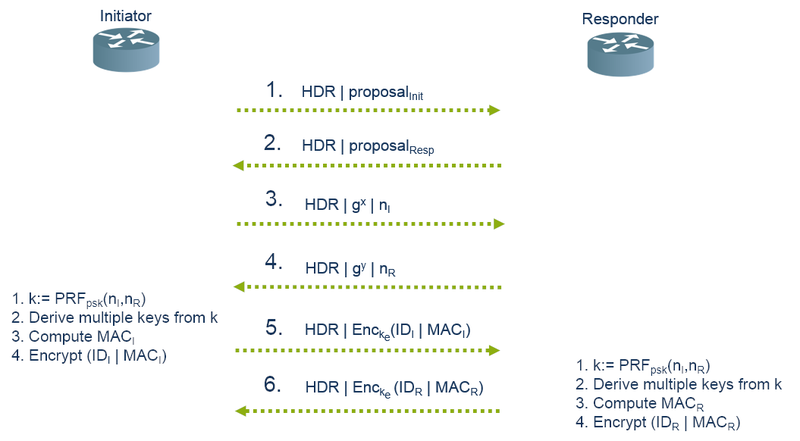 In the first two messages, the session identifier (inside HDR) and the cryptographic algorithms (proposals) are selected by initiator and responder. In messages 3 and 4, they exchange ephemeral Diffie-Hellman shares and nonces. After that, they compute a key k by using their shared secret (PSK) in a PRF function (e.g. HMAC-SHA1) and the previously exchanged nonces. This key is used to derive additional keys (ka, kd, ke). The key kd is used to compute MACI over the session identifier and the shared diffie-hellman secret gxy. Finally, the key ke is used to encrypt IDI (e.g. IPv4 address of the peer) and MACI. For the main mode, we found a similar attack when doing some minor additional work. For that, the attacker needs to waits until a peer A (initiator) tries to connect to another peer B (responder). Then, the attacker acts as a man-in-the middle and behaves like the peer B would, but does not forward the packets to B. From the picture above it should be clear that an attacker who acts as B can compute (gxy) and receives the necessary public values session ID, nI, nR. However, the attacker does not know the PSK. In order to mount a dictionary attack against this value, he uses the nonces, and computes a candidate for k for every entry in the dictionary. It is necessary to make a key derivation for every k with the values of the session identifiers and shared Diffie-Hellmann secret the possible keys ka, kd and ke. Then, the attacker uses ke in order to decrypt the encrypted part of message 5. Due to IDI often being an IP address plus some additional data of the initiator, the attacker can easily determine if the correct PSK has been found. This weakness exists in the IKEv1 standard (RFC 2409). Every software or hardware that is compliant to this standard is affected. Therefore, we encourage all vendors, companies, and developers to at least ensure that high-entropy Pre-Shared Keys are used in IKEv1 configurations. In order to verify the attack, we tested the attack against strongSWAN 5.5.1. We have implemented a PoC that runs a dictionary attack against a network capture (pcapng) of a IKEv1 main mode session. As input, it also requires the Diffie-Hellmann secret as described above. You can find the source code at github. We only tested the attack against strongSWAN 5.5.1. If you want to use the PoC against another implementation or session, you have to adjust the idHex value in main.py. We reported our ﬁndings to the international CERT at July 6th, 2018. We were informed that they contacted over 250 parties about the weakness. The CVE ID for it is CVE-2018-5389 [cert entry]. On August 10th, 2018, we learned that this attack against IKEv1 main mode with PSKs was previously described by David McGrew in his blog post Great Cipher, But Where Did You Get That Key?. We would like to point out that neither we nor the USENIX reviewers nor the CERT were obviously aware of this. On August 14th 2018, Graham Bartlett (Cisco) email us that he presented the weakness of PSK in IKEv2 in several public presentations and in his book. On August 15th 2018, we were informed by Tamir Zegman that John Pliam described the attack on his web page in 1999. Do you have a name, logo, any merchandising for the attack? We mentioned above that such an attack would require an active man-in-the-middle attack. In the logs this could look like a failed connection attempt or a session timed out. But this is a rather weak indication and no evidence for an attack. If you do not have the option to switch to authentication with digital signatures, choose a Pre-Shared Key that resists dictionary attacks. If you want to achieve e.g. 128 bits of security, configure a PSK with at least 19 random ASCII characters. And do not use something that can be found in public databases. Am I safe if I use PSKs with IKEv2? No, interestingly the standard also mentions that IKEv2 does not prevent against off-line dictionary attacks. The paper contains a lot more details than this blogpost. It explains all authentication methods of IKEv1 and it gives message flow diagrams of the protocol. There, we describe a variant of the attack that uses the Bleichenbacher oracles to forge signatures to target IKEv2. 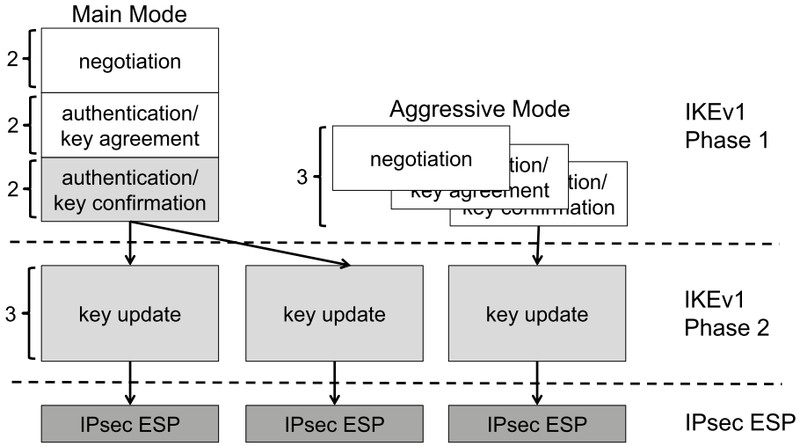 0 Response to "Practical Dictionary Attack on IPsec IKE"